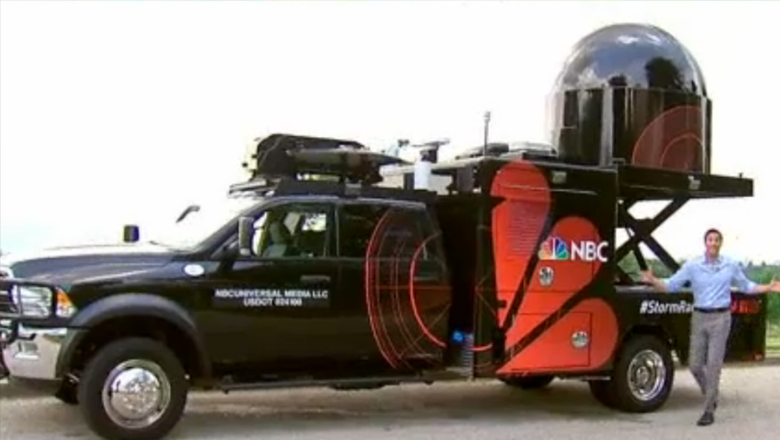 NBCUniversal is rolling out a small fleet of storm tracking and mobile radar vehicles that will serve its owned and operated stations. Dubbed “StormRangers” (or “CazaTormentas” for Telemundo stations), the new vehicles will be equipped with X-Band, dual polarization radar equipment. The first vehicle rolls out this week at WCAU-TV in Philadelphia and will “roam the Northeast corridor,” according to an NBC press release. Two additional vehicles will hit the road by the end of the week covering the Dallas-Ft. Worth, Chicago, Los Angeles and Southern California markets. In total, three vehicles will serve all of the NBC O&O stations in the country, with vehicles deployed around the country as needed. The trucks feature a bold black and red livery that merges stylistic radar “bands” with the NBC peacock. Local audiences will be able track the StormRangers through NBC- and Telemundo-owned stations’ desktop and mobile websites and station apps, says NBC. Additionally, app users will receive push notifications when StormRangers are tracking storms and severe weather in their home market. Having real-time access to this crucial weather information may help viewers better prepare for and keep their families safe from severe weather. The StormRangers feature an X-band, dual polarization, doppler weather radar with a range of 75 miles fixed atop a Dodge Ram truck. The StormRanger’s high-resolution and narrow-pulse radars also have the capability to scan storms at the lowest atmospheric layers, allowing meteorologists to determine the exact location of a storm, including its strength, its speed and where it’s headed. Each StormRanger will also be better able to detect snow, light rain, hail, and particles in the atmosphere, as well as tornado debris fields and smoke. “The radar beam from a fixed radar is too high in the atmosphere to see lower weather phenomena, but that’s where severe weather takes place – in the lowest parts of the atmosphere. With StormRanger, you can take your viewers to the weather and gather information that a traditional fixed radar could be missing,” added Stedronsky.